This naming alcohols tutorial video takes you through the steps of naming an organic compound containing a hydroxyl or ‘OH’ functional group. Examples include simple and substituted alcohols, saturated and cyclic alcohols. 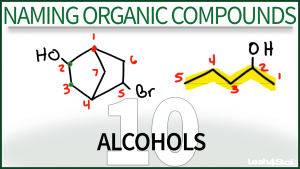 This is Video 10 in the Naming Organic Compounds Video Series. Click HERE for the entire series. Looking for more in-depth videos on Alcohols? Check out the new Alcohol Video Series! Your videos are simply superb! !It’s making organic chemistry simpler for me. Suppose -OH is to the side having less number of carbon atoms, how should the naming be done? I have a question: for the molecule 3-pentene-2-ol, my teacher would name it a different way. He would name it 2-pent-3-enol where the 2 indicates the OH and the bond position is shoved inside. Which way is right? Great videos! If you could make a list of the priorities for numbering given to all bonds (double,triple), substituents, and functional groups, that would be great! the alcohol has priority during the numbering of the carbons, but not during the naming? why don’t both of the suffixes go at the end making: pent-3-ene-2-ol? Thanks for all these video’s! I have one question, at 3:54 you say the alcohol has higher priority than the double bond (ene), why is this?